Alopecia in dogs is a skin condition that causes patchy or complete hair loss along with itchiness and redness on the skin of your dog. This disease can also affect endocrine, lymphatic system and immune system of your dog. It is one of the most common health issues found in dog and needs to be taken care because the repercussions of this disease are not very pleasant. Your pup may lose hair gradually or all of a sudden in some cases. Symptoms are very clear and easy to figure out because it will be right in front of your eyes. They are characterized by complete baldness or hair loss in circular patches. Inflammation can also be seen around the bald area. In some cases scaling can also be seen in dogs. There can be numerous causes like mange caused by the mites Demodex, tick bite, disruption in the hair growth due to infection or any auto immune disease or malfunction of the endocrine system. Hair loss in multiple patches indicates the swelling of the hair follicle. For proper diagnosis the vets rely on the order and severity of the alopecia. The most important thing in the diagnosis is to find out the cause of Alopecia so that the treatment can be designed accordingly. It is generally due to tick bite, mange or bacterial infections. Hair fall is accompanied with redness of skin and itchiness. It can be caused by the excess secretion of steroid by the adrenal glands. Low thyroid level can also be one of the reasons. High estrogen level or low level of female hormone secretion can also cause hair loss. Round worm infection, bacterial infection or scleroderma can be the cause. Treatment depends on the type of alopecia and its causes. If the hair loss is due to parasites like fleas and ticks, mites, lice or fungi, then the best treatment is to use topical medications such as Activyl, Advantage, and many more that can eradicate these parasites from your pooch’s body. There are many shampoos that treat these parasites making your dog parasite free. Prevention is the same, to keep your dog away from parasitic alopecia by using products that can protect your pets from parasites. If the alopecia is due hormonal imbalance then the treatment would be treating the disorders that cause hormonal imbalance. There are various supplements that compensate for the missing hormones or control the excess secretion of steroids. It would be better to feed your pup a proper diet so that the body functions properly and endocrine system is healthy. Alopecia caused by immune –mediated reactions can be treated by using many treatments like, topical and oral anti-inflammatories and antihistamines, corticosteroid therapy and medicated shampoos. One way to treat alopecia is by removing the allergens from the body by finding the reason for the reactions. Learn about the allergies that your Fido has to avoid the contact with allergens beforehand only. Your dog’s fur, apart from making him/her look attractive, cute and lovely, is also a layer of protection that protects him/her from all sorts of foreign body infiltration. 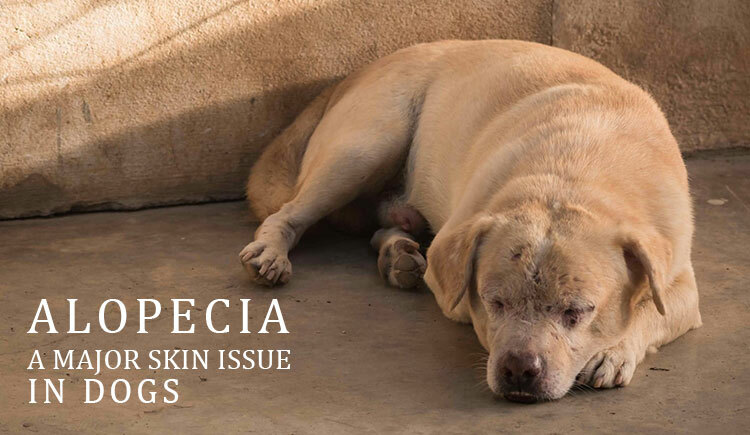 Although alopecia can make your dog look less attractive but more than that alopecia exposes your dog’s skin directly to the external agents that are ready to feed on your pooch’s body and lead to serious health issues.